CARACAS, January 18, 2016 (Reuters) – Venezuela’s socialist government decreed an “economic emergency” on Friday that will expand its powers and published the first data in a year that shows the depth of a recession fueled by low oil prices and a sputtering state-led model. The central bank, which has been lambasted by critics of President Nicolas Maduro’s government for hiding statistics since the end of 2014, said the South American OPEC nation’s economy shrank 4.5 percent in the first nine months last year. Inflation soared in that period to an annual rate of 141.5 percent, the world’s worst. Venezuela’s oil-dependent economy is forecast to perform abysmally again in 2016. Maduro lost control of the National Assembly in a December election due to voter ire over the crisis. The government’s decree, which the opposition-led assembly says it has the power to approve or reject, sets a 60-day “economic emergency” and would give Maduro wider powers to intervene in companies or limit access to currency. He vowed the country would continue servicing foreign debt despite slipping international reserves, negating growing Wall Street pessimism about a potential default this year. He also insisted “the time has come” to raise heavily subsidized fuel prices. Economists say doing so is vital to fortifying foreign reserves, but it is a politically costly move that Maduro has avoided despite repeated promises. National Assembly President Henry Ramos, a longstanding opposition leader, offered a jocular 40-minute response in which he chided Maduro and his policies and laughed off the heckling of Socialist Party lawmakers. “What angst there is here!” Ramos, 72, said at one point, sticking his tongue out at jeering legislators, during the rare opposition speech broadcast on state television. 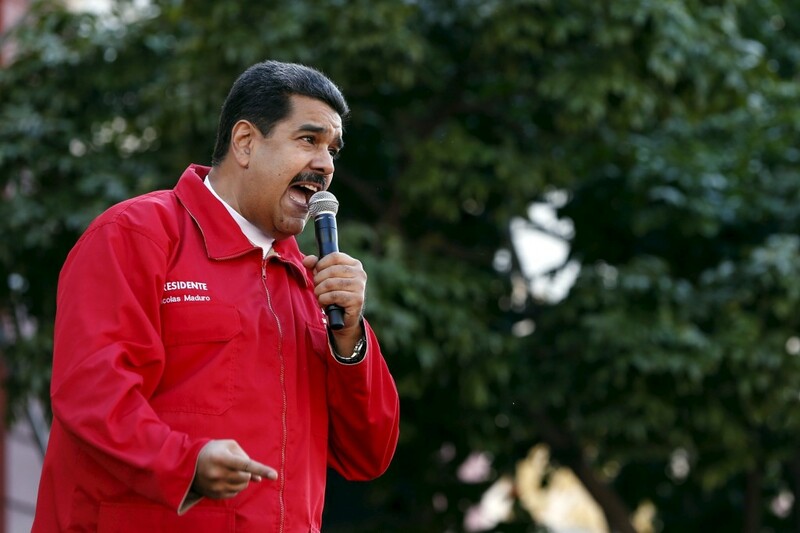 Maduro, a former bus driver and foreign minister who was elected to replace Hugo Chavez in 2013, has stuck to his mentor’s policies of strict currency and price controls. With massive shopping lines in Venezuela and widespread shortages of basics from milk to medicines, the government faces mounting pressure to change what critics call a failed model. Venezuela depends on oil for 96 percent of hard currency revenues. The average price for its basket of oil and refined products fell this week to $24.38, the lowest level in more than 12 years. “The biggest loser in Latin America of the decline in oil prices is clearly Venezuela. At this point, a credit event in 2016 seems difficult to avoid,” Barclays said in a research note. The heaviest payments in Venezuela’s roughly $10 billion foreign debt bill for 2016 come in October and November. The government blames its woes on the global oil scenario and what it says is economic sabotage by its foes. “Venezuela is suffering a new generation economic war promoted by web pages which fix the bolivar-dollar relation without any criteria or economic substance,” the central bank complained, referring to the Dolar Today website, which publishes a black market currency price to the fury of the government. The opposition coalition says policy incompetence is responsible for Venezuela’s economic mess. It has said it wants to find a constitutional way this year to remove Maduro. “An emergency economic degree without clear objectives … is only going to worsen the situation,” tweeted local economist Luis Oliveros, a frequent government critic. According to the central bank, Venezuela’s current account deficit was $5.05 billion in the third quarter, hurt by the tumble in prices for its main export.